But if you try to transfer 1080p video with iTunes, you get a wonderful little error saying “this video is incompatible with the iPad”. What’s worse, if you transfer video you already have on your iPad out of your photo library onto your computer, it won’t allow you to transfer it back. That’s right: you can play, edit and export 1080p video in iMovie from your Photo Library on your iPad as much as you want, but the minute you sync it off your iPad you can’t get your video back onto it. Well, through conventional methods that is. You can add it to your iTunes library as a movie and it still won’t transfer over. 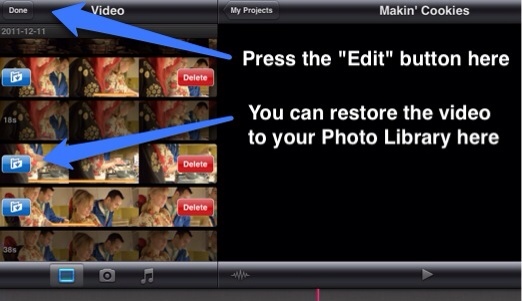 Even if you could do that, it won’t be editable by iMovie as its not in your Photo Library anyway. Great. So what’s the point of even having iMovie on the iPad then? There are a few tricks to it. Until Apple updates the compatibility list on the iOS devices or whatever else is blocking the transfer back, you have to fool it into working or bind it with your footage you edit in iMovie. Both will allow transfer back in, but if you’re trying to preserve your iMovie edit, only binding the video with your iMovie project will work. So how do you keep your video together when you’re editing? Apple planned for this and wanted to provide a method to transfer a complete project back to your mac for editing in iMovie on the Mac. What you do is to save your iMovie project for iTunes, then the video will be saved with the project and you can recall it later from the iTunes save. 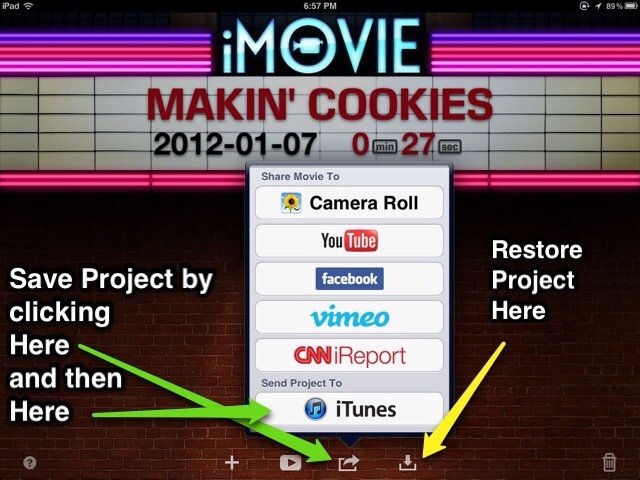 It’s the official manner to maintain valid links to your resources in your iMovie project. Now if you want to restore your video, you will have to restore the project, edit it and then in the video list, click on the edit button. The project-specific videos will be pickable and have two buttons available. Select the blue folder icon to save the video to your camera roll. The only real down side to this technique is you end up having two copies of the video on your iPad: one in your Photo Library and another stored in the iTunes-accessible project stored in iMovie. Editing a lot of video means taking up twice as much space. Not a good proposition on such a limited-space device as the iPad. Another downside is getting video from the computer to the iPad as an original file is impossible with this technique. It only works when you’ve already had it on your iPad to begin with. But it’s important for you to know about so you can properly archive off any projects you work on and to know how to bring something back once it’s been used. Another trick, not really sanctioned by Apple but I find works better and gets them onto the iPad in their native format, is to import them using the Camera Connection Kit. They get loaded as original files and can be restored from the Camera any time you like. But here’s a real nice feature: if you have an SD card and an SD card reader on your computer, you can put any compatible video into your photo library. There’s a particular trick to making it work however. You have to fool the Camera Connection Kit into believing its new original footage from your camera. To do this trick, you can either use the SD card from your camera with a picture taken on it or just create the directory structure used by your camera. With that format, you’ll end up with a file named something like VIDF1001.MOV or MYMV1324.MP4. After all the videos have copied over, you can mount your SD card to the iPad with the Camera Connection Kit. After that, it’s just like importing your photos and videos directly from the camera. The only downside of this technique is you have to be careful of your file naming and you might have to rename all your files to accommodate for this technique. There are a lot of great programs that will help in renaming, just search for file renaming tool to find one and use it. I’d recommend one, but I usually just batch the file renames. (The pluses of knowing batch file scripts and how to program). Your choice of method is ultimately up to you, and in most cases, you should probably stick to editing on your main computer. But if you’re traveling only with your iPad and camera, you can still edit up some great video. It just takes more effort. I don’t recommend editing video on an Ipad. First, There’s no good way to render videos out. Second, there are better NLE’s out there, such as Sony Vegas, Final Cut Pro, or Adobe Premiere. 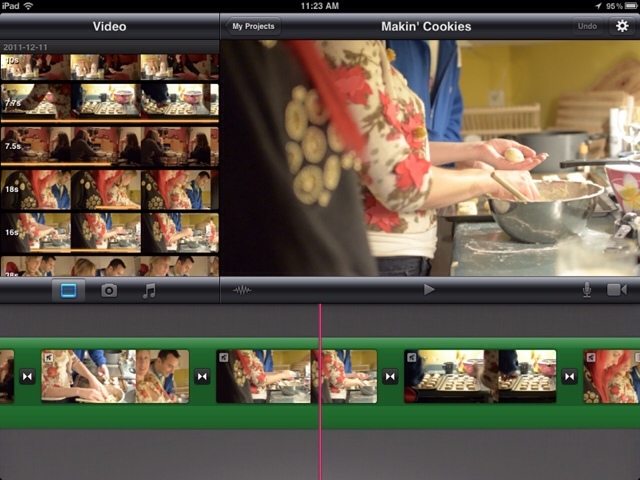 Imovie lacks GPU acceleration, and Ipads generally are too wimpy to edit untranscoded DSLR footage. Thank you for your opinion. I posit that you can indeed edit video on the iPad, it’s just not the best vehicle for editing. iMovie provides a simple starter pack to get into editing and will help put the video up to youtube for you and can certainly provide enough to satisfy a lot of people’s needs to edit their home movies just fine. Also, it’s portability makes it far easier to do so in situations where even a notebook is not the ideal situation for editing. To say you have to edit with Sony Vegas, FCP or Premiere is like saying you can’t drive a nail with your hammer because it doesn’t have the heavy-duty fiber-glass handle and a tool-steel head. Any hammer will drive a nail, but if you are wanting to work professionally, then you have to step up and get a tool that will go the distance over and over. If you need to colour-correct or any heavy editing tasks, it will certainly fail. But if you are taking your kids’ soccer game footage and want to make it for your parents, you could edit just fine in the car on your iPad for the mean time. Also, I can easily attest that the video out of most modern DSLRs are no longer using MJPEG (which iMovie will not edit) but are now using H.264 MP4 footage now, which the iPad edits natively. I have easily edited full 1080p footage on an iPad 2 without it being bogged down. I was also able to quickly get a rough edit in with iMovie on-set and get rapid approval from the director for a simple project we were working on, get approval and then transfer over to my main mac and perform the editing on FCP for the final output. This was editing footage from a Canon 5D Mk II and some pick-ups on my Nikon D5100. Everyone starts somewhere, and the intent of this site is to show that you don’t have to get the best camera, most powerful computer and expensive editing suites to start making video. You need imagination and desire and maybe you can work with equipment you already own. Everything else just makes it easier. If you want to chase the tech tail, go right ahead and be admonished for not having a RED Epic or Phantom for your work. This whole revolution is due to the some of the same manufacturers of those professional video cameras starting to add video capability to relatively inexpensive still cameras that can use great glass. I started this whole blog to demonstrate a modestly priced DSLR has the capability to record relatively high quality footage if you follow the right steps. The same applies to using iMovie on an iPad. You can start editing right there and take it to another tool later when you have the time and money to upgrade or not: the choice is yours. I did not say anyone had to use a pro NLE. Or anyone needs a RED. All I said was there were better tools out there that would do the job better, and some of them are relatively inexpensive, like Sony Vegas, at less than 100 dollars. Sorry for misconstruing your intent of your first comment. I thought you were writing to state how editing video on the iPad cannot be done. I now see you only stated that you don’t recommend it but proceed to say there’s “no good way to render out footage” and “iMovie doesn’t use a GPU”. If you’re expecting to generating a lossless 1080p HDV video footage from iMovie and are performing superfluous transitions on the fly, you are right: iMovie won’t fit the bill. In no way is that the expressed intent of the article. To be perfectly clear, the article was originally generated when there was a problem getting native 1080p video onto the iPad in a manner that could be edited in iMovie. The article pointed out how to work around a nagging message iTunes would display when you tried to upload source footage via iTunes from your computer and then abort the copy. You don’t have to step through those hoops to do so any more as the interfering error message has been long since removed. I’ve been considering just dropping this article but thought I should leave it for “posterity”. Notice the first big three articles are about shooting video with a Nikon D5100? A lot of people say you should get a Canon if you’re going to shoot video, but the whole intent of the articles was to show you could get the same quality of footage from a camera that was $2000 LESS than the 5D, but you have to trade off some features to do so. I won’t be telling people to not edit video on the iPad. If your camera generates 1080p h.264 video natively, just copy it over and iMovie will scrub through real-time with it. I won’t be telling people to stay away from Sony Vegas Video. I’m only providing options on how they can so they aren’t stuck in the rut of not being able to work create because they don’t have the $100 for Sony Vegas Video but they do have access to an iPad with iMovie on it. Remember is it isn’t the tools, it’s the talent that uses them.